This is the season for the MSM water flush; the non-drug, non-side effect solution for allergies*. 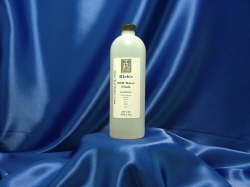 Customers say Rich MSM Water Flush works great for sinuses. Also available in a 16oz size bottle. Great for refilling or for all of your anti-bacterial needs! (Purified water, MSM, Copper, Silver, Zinc and Salt) MSM (methyl sulfonyl methane) Water drops provide the cellular nutrition necessary to make the outer tissues soft and permeable. MSM Water Flush are safe for all topological uses, but should not be used in the eyes. Customers report marvelous results when used in the nasal cavity and in the ears. MSM softens leathery tissue, equalizes pressures, repairs damaged membranes, clears up red spots and broken vessels, helps remove blemishes and other tissue particles. Some health care practitioners are using MSM water drops and their patients are seeing great results, even within one day. Your skin is like a water balloon. The outer tissue normally allows fluids to flow through the membrane wall, which acts like a filter supplying nutrition and cleaning out particles keeping your epidermis clear so your veins are good. When the membranes become tough like leather the fluids are trapped and the particles start to build up. If the build up continues it will seem as if you are looking through a frosted glass. This may be the world`s best-kept secret. As MSM is applied for new and different ills the results seem to be the same. The body can heal itself if it gets the right food and nutrients.